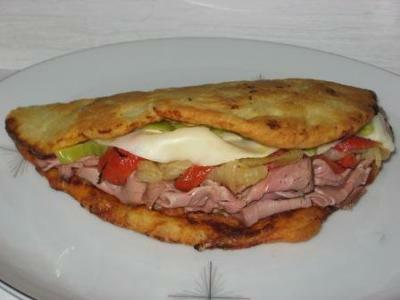 To make this pizzandwich (pizza sandwich) you can use whatever deli meat, cheese and peppers you have on hand or whatever is your child's favorite. Add lettuce, cucumber, tomato or other vegetables to add variety. 1. Pre-heat oven to 410F (210C) degrees and grease two pizza pans with olive oil. 2. Roll out pizza dough into 8-inch rounds, then place on baking pans and prick thoroughly with a fork. 3. Smear on marinara sauce (1/4 cup each pizza) and top with Asiago cheese (1/4 cup each). 4. Bake for about 20 minutes until crust is golden (this can be made more quickly on the outdoor grill and adds a nice smoky flavor). 5. Build sandwich by scoring pizza base down the middle (do not cut through). 6. On one half of each pizza place quarter of each portion of beef, bell pepper, Provolone cheese and banana peppers. Fold other pizza crust half over the top and serve. the pic looks awesome! bet it tastes even better!